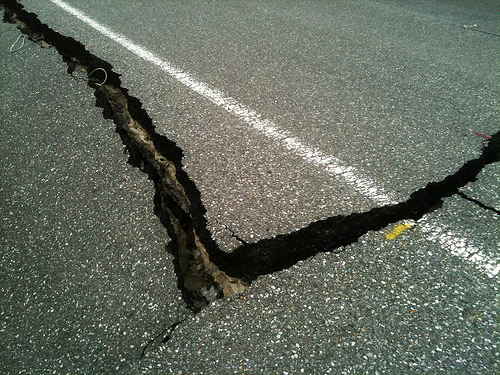 A fault line is a break in the earth’s crust between two geologic plates moving in different directions. The slow buildup of tension eventually causes one plate or the other to give. When that happens it’s called an earthquake, and all to often an earthquake is the scene of massive devastation. When we point our fingers in blame a fault line is created. It builds tension that is as unseen as the movement of geologic plates but just as real. Eventually, something’s got to give. Ironically, one of the ways to avoid creating that tension is to give – to give a little in your position, give time, give an inch, give back, or give your full attention to another’s thoughts and feelings. If something’s going to give eventually anyway, why bother finding the fault. Today’s gift of time … Hosted a marvelous open house for our Toastmasters club (marvelous because of our guest speakers, and our excellent members) … Brought supper to my son’s Robotics team. This entry was posted in In the community and tagged fault line. Bookmark the permalink.